This build is designed as a very budget and SSF gear viable map clearing build that works from no unique items. Check the video below to see it in action in a T16 Zana mission. This is another CwC build from me as I just really enjoy working with the CwC mechanic and this build turned out to be one of the most fun builds that I've ever played in my nearly 7 years of PoE. It blows maps up! With COLDSPLOSIONS! How does it do this COLDSPLOSION awesomeness? 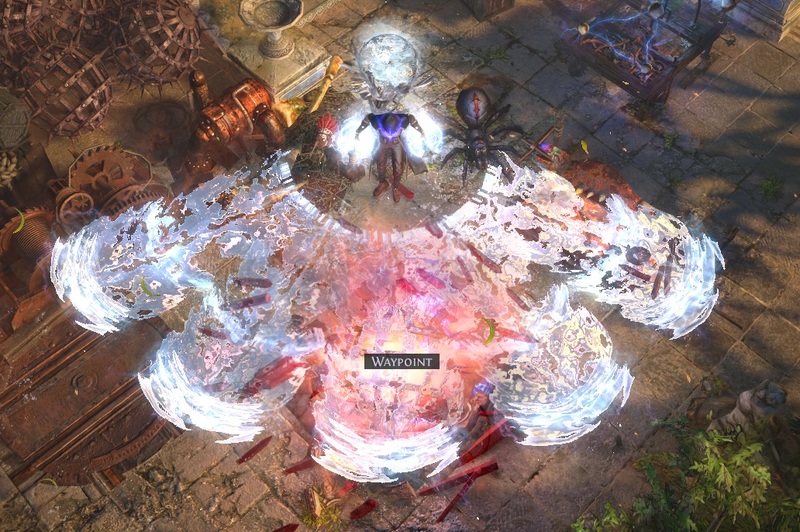 Winter Orb Cast While Channelling Freezing Pulse Herald of Ice Herald of Thunder Elementalist. Not a great deal as it turns out. You can look at my character 'Winter Pulse Bomber' on my profile to see what gear I currently am using for some guidance. Then gravy stats would be % cold and Gain % of cold damage as extra chaos. Shaper ring with 'Curse Enemies with level * assassins mark on hit' is fantastic for generating power charges. Not a requirement, but really really nice to have. If you can't get one of these ring you can still get power charges through Curse on Hit + Assassin's Mark linked to you Herald of Thunder gem. A six link chest with 3 blue 3 green sockets. Can be anything from a tabby or corrupted rare chest. I've gone for the shaper rare chest with '+1 to active skill gems' prefix to boost the damage of Winter Orb and Freezing Pulse. Inpulsa would work great if you wanted to burn some wealth on this build but really isn't needed. Herald set up: Helm & Gloves ideally. Just 4 links on them. But there are options. Shaper Helm with 'Socketed Gems are supported by level * Innervate' gives a 5 link to Herald of Ice. Gloves can have the syndicate craft of '+1 to level of socketed AoE gems' to give Herald of Thunder a small boost. Not needed but nice to have if you can. For abyssal jewels go for flat life and spell damage for cold stats (lightning isn't terrible either but cold is first choice). Regular jewels can help to scale the Herald damage as they give %cold damage that applies to all sources where spell damage doesn't affect Heralds. If you don't have a shaper assassin mark curse ring then use Curse on Hit + Assassin mark with your Herald of Thunder for power charge generation. I'm working on getting a Vaal Righteous Fire set up in my boots for a short term damage boost on bosses. Yellow. Red. Blue. Orange. Purple. Adding into the green areas as and when I though certain things were needed (more life for lab, some mana problems and so on). Although you could switch these pairs to unlock Beacon of Ruin sooner. If you have any questions please ask them here and also feel welcome to stop by my twitch stream, if I am live I am always happy to answer anything there.